A Cold War weapon that proved to be obsolete. Key point: The Soviets developed the 2A3 was a response to American nuclear artillery. Unfortunately, as its development dragged on the entire concept became obsolete. In the 1950s, both NATO and Warsaw Pact doctrine focused on the employment of tactical nuclear weapons. Truly strategic nuclear weapons and the doctrine of mutually assured destruction (MAD) were at their infancy at the time, so nuclear weapons were seen as a tactical as well as a strategic tool. As a result, both the United States and the Soviet Union developed a multitude of battlefield nukes, from the tiny Davy Crockett nuclear recoilless rifle to the M65 Atomic Cannon. The Soviet Union responded in kind, beginning the development of their own massive atomic howitzers and even mortars. The largest of these pieces was the massive 406mm Soviet 2A3 “Kondensator.” But in the end, this piece was a failure. It was mechanically complex and obsolete by the time it was adopted. Why did the Soviet Union produce these massive white elephants? Can anything be learned from the folly of the 2A3? Why was the caliber so huge compared to American guns? The story of the 2A3 begins in 1954. 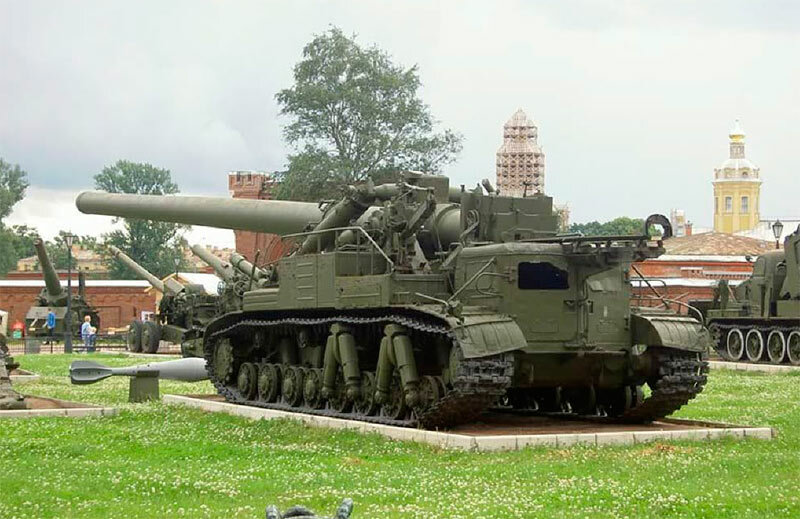 The United States had rolled out the 280mm M65 atomic cannon just a year before, and the Soviets needed to catch up. Their response came in two forms, the 406mm howitzer (2A3/Object 271) and a 420mm mortar (2B1/Object 273). The initiative to develop these two weapons was approved by the Council of Ministers in April 1955. The first ballistic test barrel was completed later that year, and in December 1956 the first prototype was created by mating the gun with the chassis. The design was paraded on Red Square in 1957. The chassis for the 2A3 was derived from the T-10 heavy tank with additional hydraulic shock absorbers to absorb the massive recoil force of the 406mm projectile. Despite these measures, the 2A3 would travel a few meters back with every shot, and inevitably something would break and minor repairs would have to be conducted. Aiming the gun was largely achieved by rotating the chassis, although small precision adjustments could be made with a limited electric traverse mechanism. The reason for the massive caliber of the cannon was simple: Soviet engineers at the time weren’t sure if they could construct compact nuclear ammunition, so a large caliber was specified to make the design of the nuclear projectile easier. The final projectile design weighed 570kg and could be launched out to a range of around twenty-five kilometers, just a few less than the M65 Atomic Cannon and far less than modern conventional artillery. The whole vehicle weighed around sixty-five tons. As a result of this massive weight, the 2A3 was incredibly slow and faced significant mobility challenges; it couldn’t travel across most bridges and its massive size meant that it couldn’t really travel through cities or even under some low hanging power lines. The range was also found to be lacking relative to nuclear rockets or modern tactical missiles. As a result, production of the 2A3 was cut off after only four units were produced in favor of newer nuclear rocket such as the Luna (FROG-7). These missile systems were far more mobile and compact relative to the massive 2A3 and had almost triple the range at seventy kilometers. The Soviets developed the 2A3 was a response to American nuclear artillery. Unfortunately, as its development dragged on the entire concept became obsolete. Perhaps what can be learned is that in making “big” guns and rockets, it’s always best to keep an eye on upcoming technologies that could fundamentally alter the battlefield such guns might fight on. The Soviets would continue developing tactical nukes for use in artillery, but later shells utilized miniaturized warheads that allowed nukes to fit in compact projectiles in the Soviet-standard 152mm and 203mm calibers. Likewise, the United States also made nuclear shells in the 155mm and 203mm calibers after abandoning the 260mm M65 cannon.